Goose is bringing the Oliver Garden Pond Terras out with 50% off to Hello Tuesday. 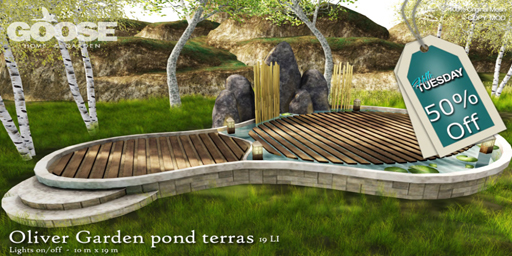 This wonderful dal is perfect if you're looking for a small, serene hide out spot in your garden or sim. Decorate it with some chairs and enjoy the tranquility of the pond below you. It comes with Rock, Bamboo and Waterlilies decor. Garden lights can be turned on and off. The terras takes up a 10x19 m space, comes at 19 Land Impact and Permissions are Modify & Copy. Hello Tuesday is a one off deal so don't miss out!